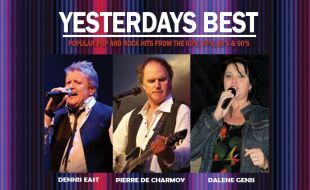 The “Yesterdays Best” team, featuring “Pop-Star - Pierre De Charmoy”, “Rocker - Dennis East” and the “Lady - Dalene Genis needs no introduction to the music industry and audiences throughout South Africa. This group of artists will take you back on a nostalgic journey of the hits from yesteryear that you’ve always loved and still listen to like “A Million Drums”, “Dammit I Love You”, “Don’t Tell Me What To Do”,”Live On”, “Reaching Out” and many more popular and known hits. Join us and enjoy recalling these songs sung and performed by the STARS that made them popular.